Body systems organization emphasizes core systems and advanced concepts. 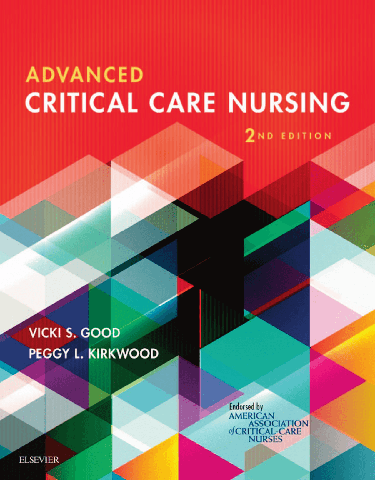 Consistent chapter format features numerous illustrations, charts, and graphs in each chapter to enhance understanding.Synthesis chapters address patient conditions that involve multiple body systems — a common occurrence in critical care nursing.Unfolding case studies with decision point questions are included at the end of all disorders chapters, providing opportunities to apply advanced critical care content to actual scenarios.Medication tables incorporate common classifications of critical care drugs for specific disorders, including drugs, actions, and special considerations.NEW! Updated information throughout reflects the latest evidence-based content as well as national and international treatment guidelines.NEW! Streamlined content places a greater focus on the need-to-know information for today’s high acuity, progressive, and critical care settings.NEW! Expanded coverage of emerging and infectious diseases and multidrug-resistant infections keep readers up to date with the most topical diseases, such as the Zika virus.NEW! Additional content on alternative settings for critical care now includes the eICU and remote monitoring. NEW! Full-color design clarifies important concepts and improve the book's usability.